Since their season ended last month, the Hurricanes have had to deal with the losses of multiple members of their defense, some players opting to transfer out of the program, while others have declared for the NFL draft. It appears Miami’s defense has been dealt another blow, this one with potentially serious implications for one of its top cornerbacks. 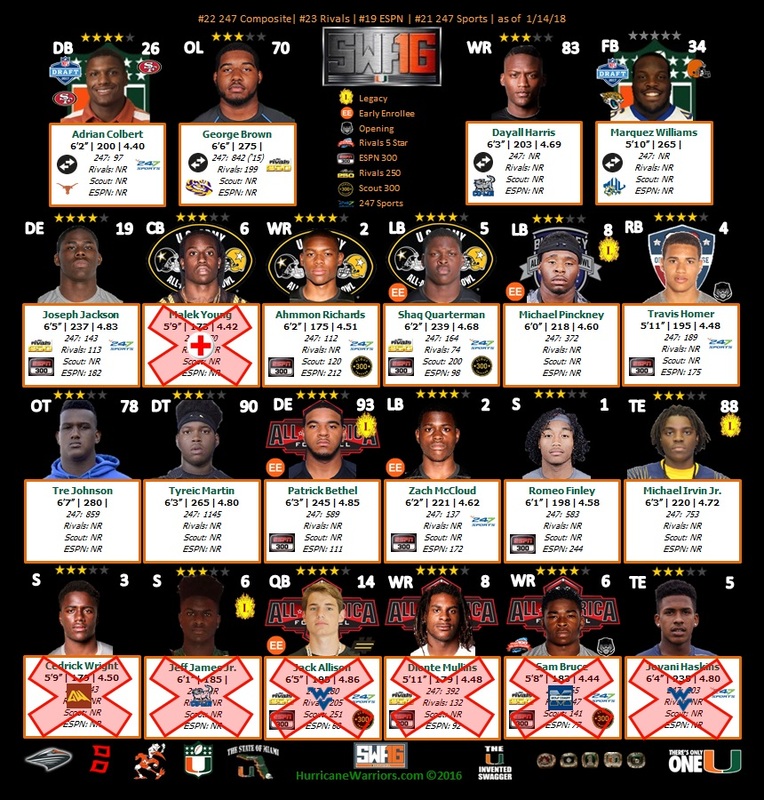 As of late Saturday night, Miami had not commented on the report, but several Hurricanes took to social media offering support for Young, including Miami defensive coordinator Manny Diaz. Shortly after Young posted a picture of himself on both Twitter and Instagram with the message “God has [a] better plan,” Diaz responded with to Young with a message of his own. Young, a rising junior out of Coconut Creek High, became a viral sensation early this season when he became the first Hurricane to wear Miami’s famed Turnover Chain after recording an interception in the Hurricanes’ season opener against Bethune-Cookman. Young went on to play in all 13 of Miami’s games this season, starting 10. He finished with 43 tackles, two interceptions and he broke up a team-high eight passes. 2017 (Sophomore): Saw action in all 13 games and made 10 starts…Earned All-ACC Honorable Mention recognition…Was among Miami’s top contributors in secondary…Had 43 total tackles and 3.0 tackles for loss…Finished with two interceptions and led team with eight pass breakups…Recorded second interception of career in season opener against Bethune-Cookman (Sept. 2)…Returned pick 24 yards…Added 1.0 TFL (five yards) vs. Wildcats…Set career mark with seven tackles (five solo) in win over Toledo (Sept. 23)…Added 1.5 TFLs (four yards) and had one PBU vs. Rockets…Made first start of season in win at Duke (Sept. 29), finishing with three solo tackles…Recorded career-high three PBUs in win against Blue Devils…Started and finished with five tackles (two solo) and 0.5 TFLs in win at Florida State (Oct. 7)…Posted two tackles (one solo) in start vs. Georgia Tech (Oct. 14)…Started and finished with two solo tackles and one PBU in win over Syracuse (Oct. 21)…Started and had two tackles and one PBU in win at North Carolina (Oct. 28)…Tied career high with seven tackles (five solo) in start against Virginia Tech (Nov. 4)…Recorded second interception of season and added two tackles and one PBU in win over Notre Dame (Nov. 11)…Finished with four solo tackles in win over Virginia (Nov. 28)…Started and had five tackles (two solo) at Pittsburgh (Nov. 24)…Started ACC Championship Game against Clemson (Dec. 2) and finished with three tackles…Saw action in Capital One Orange Bowl against Wisconsin (Dec. 30). 2016 (True Freshman): Saw action in 12 games and emerged as starting cornerback late in season, starting final four games…Finished with 23 tackles (17 solo) and one interception…Saw action in season opener against Florida A&M (Sept. 3) and recorded one solo tackle…Saw action against FAU (Sept. 10) on special teams…Recorded two solo tackles in road win at Appalachian State (Sept. 17)…Saw action on special teams in road win at Georgia Tech (Oct. 1)…Competed against Florida State (Oct. 8)…Had one tackle against North Carolina (Oct. 15)…Saw action at Virginia Tech (Oct. 20) and at Notre Dame (Oct. 29)…Totaled career-high six tackles (three solo) in win over Pittsburgh (Nov. 5)…Made first career start and totaled three tackles in win at Virginia (Nov. 12)…Matched career high with six tackles (five solo) and recorded first interception of career vs. NC State (Nov. 19)…Interception was recorded in end zone and ended lengthy Wolfpack drive…Started and totaled four tackles (three solo) in regular season finale win over Duke (Nov. 26)…Started against West Virginia (Dec. 28) in Russell Athletic Bowl victory. High School: Consensus three-star cornerback prospect by ESPN, Rivals, 247Sports and Scout…Selected to the U.S. Army All-American Bowl…Ranked as No. 34 cornerback prospect nationwide by ESPN and Rivals…Had 35 tackles and four tackles for loss in final season at Coconut Creek…Added 35 passes for 684 yards and 10 touchdowns in 2015…Totaled seven return touchdowns during junior year…Had four kickoff return TDs and three punt return TDs…Chose Miami over Auburn, Clemson, Georgia, Ohio State and Florida State, among others.